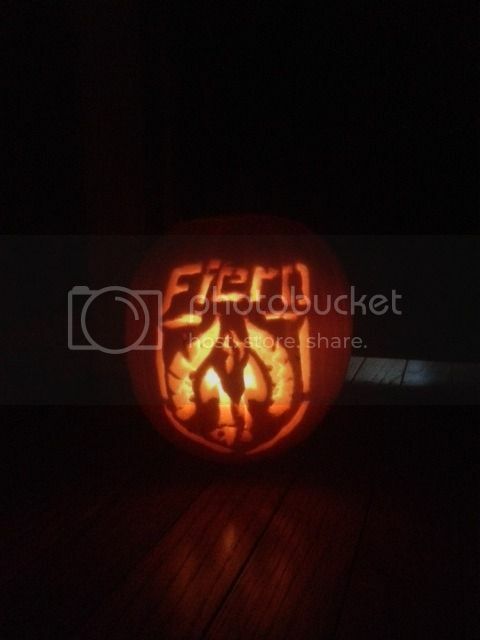 Fiero Pumpkin Carving - with template! I figured I'd post this here in case anyone else wanted to use the template that I made to make their own. Just print it out, tape it to your pumpkin, and poke holes around the pattern just like any other pumpkin pattern. When you get to carving, start with the center parts - head, then legs, and move outward. 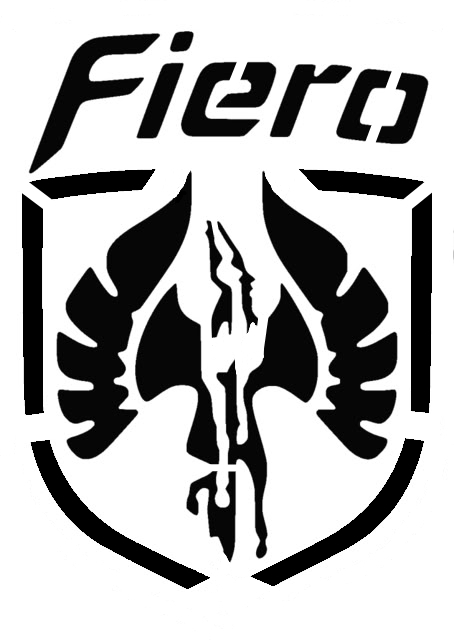 I saved the badge outline for last, you could go without the outline as well if desired. Man that is flippin sweet! I don't do carvings but I may try that one! That is seriously cool, I love it. Very Cool! Looks like the back of my helmet! One of the things that you can try if you don't feel comfortable cutting all of the holes is to trace the design, cut only the skin, and remove only the skin of the design leaving the actual pumpkin "pulp" alone. Then shave down the inside walls of the pumpkin to make the front wall thinner. 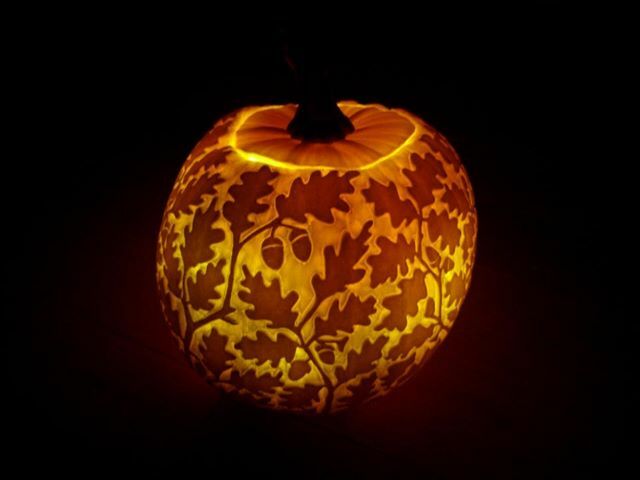 The light will shine through the pumpkin "pulp" but the skin that you did not remove will block out the light creating dark areas. That's a great way to do it as well IMSA GT. I almost did that for the badge outline so that I could keep it as one continuous line. That is pretty kewl. We skipped "carving" this year. I have 4 black lights lighting up our porch, sso instead of carving, we drew what we wanted on the pumpkins and then I painted the designs in with glow in the dark paint. My daughter wanted Applejack, a My Little Pony. My wife wante a Franken Goofy (Disney Goofy). I just did a scary face, my son wanted a smiley facr and my other daughter wanted a cat. I've got 2 more to finish tomorrow night, one a haunted house scene and the other I haven't completely decided yet. I was thinking science beekers, and cutting out the tops of them as this will be the only hollowed out and carved pumpkin we do this year. It will be filled with water and dry ice (it's a rather large pumpkin, 30+ lbs). Thanks for posting that. I had fun! I should have used a larger pumpkin, I had to print as 5x7 and the detail was tight, but it looks cool! Also, I've never carved a white pumpkin before and it's awfully hard to see my transfer. Looks great! It definitely helps to have a good sized pumpkin to begin with, but it looks like yours turned out great anyway! It's that time of year again! I'm thinking about doing another one of these, but possibly switching up the design a bit this year. I was just thinking about that pumpkin. Good luck with your new design! it was a hit on my block last year. Thanks again! Awesome! Last year I did mine a few days before Halloween and tried to preserve it using various methods that I found online. Unfortunately, none of them worked and by the time Halloween rolled around it was pretty much unrecognizable. This year I'll have the design ready in advance, but I'm not going to carve it until the 31st. I'm not gonna lie I LOL'd but only because it's AWESOME. Nice carving.